1 To prepare the farro, bring the water, farro, anise seeds, cinnamon stick, and salt to a boil in a heavy-bottomed 4-quart saucepan. Decrease the heat to maintain a simmer, cover, and cook until the farro is tender but still slightly chewy (20 to 25 minutes for pearled farro, 50 minutes for Bluebird Whole Grain Farro). Remove the cinnamon stick, drain any remaining liquid, and return the farro to the saucepan. 2 Meanwhile, prepare the roasted grapes. Position a rack 6 inches from the heat source and preheat the broiler for 5 minutes. Spread the grapes on a large rimmed baking sheet. Drizzle with the olive oil and 2 tablespoons of the honey and toss to combine. Broil until the grapes just start to shrivel and release some juices as they burst, 5 to 7 minutes. Immediately transfer the grapes with their juices to a heatproof bowl. 3 To finish, add the cream and vanilla extract to the farro and bring to a boil over medium heat, stirring frequently. Cook until the cream thickens slightly, 3 to 5 minutes. Stir in the remaining 2 tablespoons honey, add the grapes with their juices and cook just long enough to reheat the fruit, about 2 minutes. Divide among bowls, sprinkle with cinnamon, and serve warm with more honey on the side. 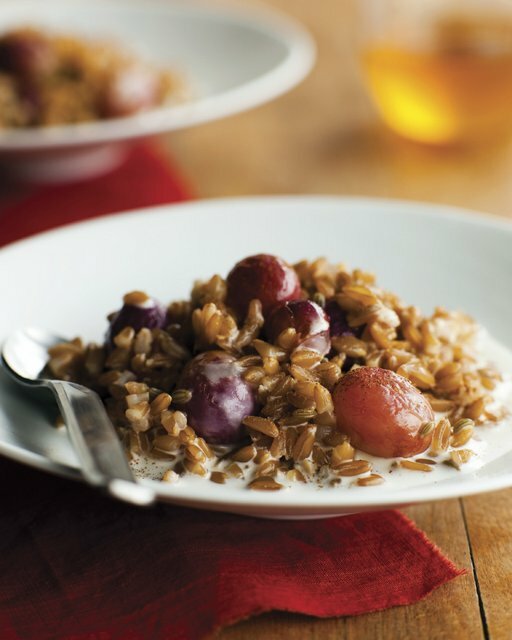 to get a head start: Make the farro, as in step 1, ahead (see page 25). The grapes can also be roasted 1 day ahead. Chill, covered. to vary it: If you like a bit more chewiness, try other berries from the wheat family such as spelt, Kamut, or soft whole wheat. You will need a scant 3 cups (for cooking instructions, see page 25).